indicates that the paper has been made available recently. Click on to download the online version of the paper. Click on for supporting material associated to the paper or the direct link to the journal. H. Zenil, F. Soler-Toscano, J.-P. Delahaye and N. Gauvrit, Methods and Applications of Algorithmic Complexity, Springer-Verlag, forthcoming in 2017. V. Kempe, N. Gauvrit, D. Forsyth, Structure emerges faster during cultural transmission in children than in adults, vol 136, pp 247–254, Cognition, 2015. N. Gauvrit, K. Morsanyi, The Equiprobability Bias from a Mathematical and Psychological Perspective, Advances in Cognitive Psycology, pp. 119-130, 2014. DOI:10.5709/acp-0163-9. J.-L. Dessalles, Algorithmic simplicity and relevance, Algorithmic Probability and Friends. Bayesian Prediction and Artificial Intelligence, Lecture Notes in Computer Science Volume 7070, pp 119-130, 2013. N. Gauvrit, H. Zenil, F. Soler-Toscano and J.-P. Delahaye, Algorithmic complexity for short binary strings applied to psychology: a primer, Behavior Research Methods, 2014 Sep;46(3):732-44. doi: 10.3758/s13428-013-0416-0. 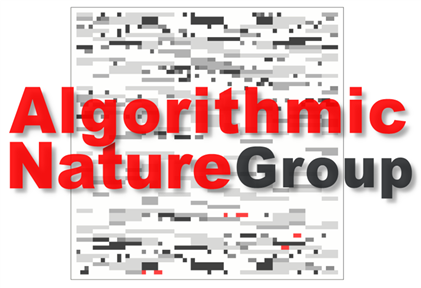 H. Zenil, Turing Patterns with Turing Machines: Emergence and Low-level Structure Formation, Natural Computing (formal connections between structure and patterns in nature), DOI: 10.1007/s11047-013-9363-z, 2013. J. J. Joosten, On the necessity of complexity. In H. Zenil (ed), Irreducibility and Computational Equivalence: 10 Years After the Publication of Wolfram’s A New Kind of Science, Springer Verlag, 2013. Book webpage. J. J. Joosten, Complexity fits the fittest. In I. Zelinka, A. Sanayei, H. Zenil, O. E. Rossler (eds), Emergence, Complexity and Computation in Nature, Springer Verlag, to appear in 2013. J-P. Delahaye and H. Zenil, Towards a stable definition of Kolmogorov-Chaitin complexity, in preparation. (first draft available). The Spanish edition of Scientific American (Investigación y Ciencia) No. 447 publishes an article entitled “From Digital Universes to the Mind: New tools to quantify our intuition of complexity and randomness” (De los universos digitales a la mente: Nuevas herramientas para cuantificar nuestra intuición sobre la complejidad y el azar). Full article here. H. Zenil, and J.-P. Delahaye, Un método estable para la evaluación de la complejidad algorítmica de cadenas cortas (A Stable Method for the Evaluation of the Algorithmic Complexity of Short Strings). In G.J. Martinez, H. Zenil and C.R. Stevens (eds), Complex Systems as Computing Models, Luniver Press, 2011. J.J. Joosten, F. Soler-Toscano, H. Zenil, Complejidad descriptiva y computacional en máquinas de Turing pequeñas, En Lógica Universal e Unidade da Ciência, Centro de Filosofia das Ciências da Universidade de Lisboa, pp. 11–32, 2011. J.J. Joosten, F. Soler-Toscano and H. Zenil, Program-size versus Time complexity, Slowdown and speed-up phenomena in the micro-cosmos of small Turing machines In H. Guerra (ed.). Physics and Computation 2010, Pre-Proceedings, CAMIT, University of Azores, 3rd International Workshop on Physics and Computation, Luxor, Egypt, 2010. J.J. Joosten, H. Zenil and F. Soler-Toscano, Fractal Dimension as an Indication of the Terminating Runtime of Discrete Dynamical Systems, (abstract p. 214) in S. Thurner M. Szell (eds), Löcker Verlag, ECCS’11, Vienna 2011. H. Zenil (ed), Randomness Through Computation: Some Answers, More Questions, World Scientific, Singapore, 2011. N. Gauvrit and J.-P. Delahaye, Comme par hasard ! : Coïncidences et loi des séries, Book-e-book.com, France, 2012. J.-P. Delahaye, Complexité aléatoire et complexité organisée, Editions Quae, France, 2009. N. Gauvrit, Vous avez dit hasard ? : Entre psychologie et mathématiques, Belin, France, 2009. J.-P. Delahaye, Complexités : Aux limites des mathématiques et de l’informatique, Pour La Science, Bibliothèque Scientifique, France, 2006. F. Soler-Toscano, Razonamiento abductivo en lógica clásica, College Publications, UK, 2012. PLoS ONE, Physica A, Visual Cognition, Computability, Natural Computing, Applied Mathematics and Computation, Cognition, Complexity, Behavior Research Methods, Minds and Machines, Complex Systems, International Journal of Unconventional Computing and Advances in Cognitive Psycology. There is also a book forthcoming from Springer Verlag.